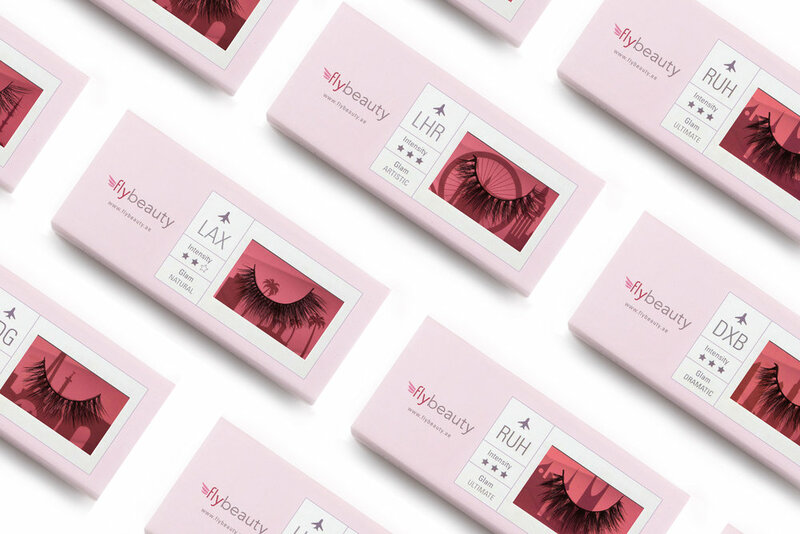 FlyBeauty is a new beauty brand that offers eye lashes and hair extensions based in Dubai, UAE. It commissioned Blue Hat to create a Branding Strategy. Being concerned by the fierce competition within this sector in the GCC market, Blue Hat was very keen on building the branding identity around a strong core differentiator. Target Audience: Blue Hat identified a niche for Fly Beauty, which is the "busy khaleeji woman, who is always traveling or is on-the-go and wants to look glamorous all the time". Packaging: Blue Hat created the ultimate beauty travel companion, that is easy to use and pack. Tribal Message: Blue Hat created the slogan"كشخة عالطاير" which means beauty on the go or "FlyBeauty" in Khaleeji slang. Trend: Blue Hat focused on the trend of "localization" as well the rising trend of "social vanity" and the selfie wave. Blue Hat located the most visited cities by women in the GCC. It developed the entire brand around the theme of airports and travel. The package was shaped as an airline ticket. Blue Hat created a unique brand experience when designing the lashes packages that includes each city's skyline and a hidden message to create an element of surprise. Blue Hat is currently in the process of developing FlyBeauty's e-commerce website. Stay tuned to discover it once it's released!